The Bizbee Deportation of 1917 involved the forcible removal of striking workers. The incident is sometimes described as “the illegal deportation” of the workers, but it should be noted it was carried out by law enforcement officers, with the assistance of deputized civilians. All Women and Children Off the Street Today! I have formed a Sheriff’s Posse of 1200 men in Bisbee and 1000 in Douglas, all loyal Americans, for the purpose of arresting, on charges of vagrancy, treason, and of being disturbers of the peace of Cochise County, all those strange men who have congregated here from other parts and sections for the purpose of harassing and intimidating all men who desire to pursue their daily toil. I am continually told of threats and insults heaped upon the working men of this district by so-called strikers, who are strange to these parts, yet who presume to dictate the manner of life of the people of this district. Appeals to patriotism do not move them, nor do appeals to reason . At a time when our country needs her every resource, these strangers persist in keeping from her the precious metal production of this entire district. Today I heard threats to the effect that homes would be destroyed because the heads of families insisted upon their rights as Americans to work for themselves, their families and their country. Other threats have and are being daily made. Men have been assaulted and brutally beaten, and only today I heard the Mayor of Bisbee threatened and his requests ignored. We cannot longer stand or tolerate such conditions! This is no labor trouble – we are sure of that – but a direct attempt to embarrass and injure the government of the United States. I therefore call upon all loyal Americans to aid me in peaceably arresting these disturbers of our national and local peace. Let no shot be fired throughout this day unless in necessary self defense, and I hereby give you warning that each and every leader of the so-called strikers will be held personally responsible for any injury inflicted upon any of my deputies while in the performance of their duties as deputies of my posse, for whose acts I, in turn, assume full responsibility as Sheriff of this County. 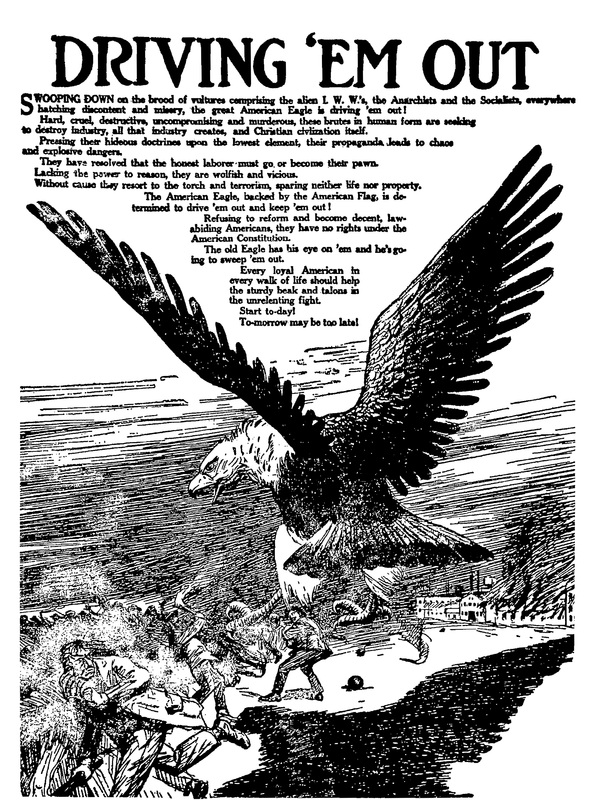 “Driving ‘Em Out” – published in Rob E. Hanson The Great Bisbee I.W.W. Deportation of July 12, 1917 (Signature Press, 1989). Rob E. Hanson The Great Bisbee I.W.W. Deportation of July 12, 1917 (Signature Press, 1989). No longer in print. Contact me for more information about this title. University of Arizona, web exhibit. The Bisbee Deportation of 1917. This site includes analysis and a collection of primary sources.